The 55th British Academy Film Awards, given by the British Academy of Film and Television Arts, took place on 24 February 2002 and honoured the best films of 2001. The Lord of the Rings: The Fellowship of the Ring won Best Film, Best Director for Peter Jackson, Best Makeup and Hair, and Best Visual Effects. 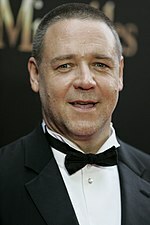 Russell Crowe won Best Actor for A Beautiful Mind, which also won Best Supporting Actress for Jennifer Connelly. Judi Dench won Best Actress for Iris and Jim Broadbent won Best Supporting Actor for Moulin Rouge!. Gosford Park, directed by Robert Altman, was voted Outstanding British Film of 2001. Baz Luhrmann – Moulin Rouge! Jim Broadbent – Moulin Rouge! After winning the BAFTA Award for Best Actor in a Leading Role, Russell Crowe gave a speech in which he quoted a poem by Patrick Kavanagh. When the ceremony was broadcast, Crowe was upset that the poem was cut. He blamed the producer, Malcolm Gerrie, and confronted him about it. It was reported that the confrontation got physical and there was speculation that it would cost him the Academy Award for Best Actor. The agonising pincer-jaws of heaven." ^ Susman, Gary (2002-03-05). "Scary Crowe". Entertainment Weekly. ^ Deans, Jason (2002-03-04). "Crowe is Gerrie sorry". The Guardian. London. ^ "ARTS | The poet behind Russell Crowe's rage". BBC News. 2002-03-05. Retrieved 2009-11-12. ^ "Crowe 'clarifies' BAFTA outburst | Film | guardian.co.uk". London: Guardian. 2002-02-28. Retrieved 2009-11-12.